1. What is the Trends view? 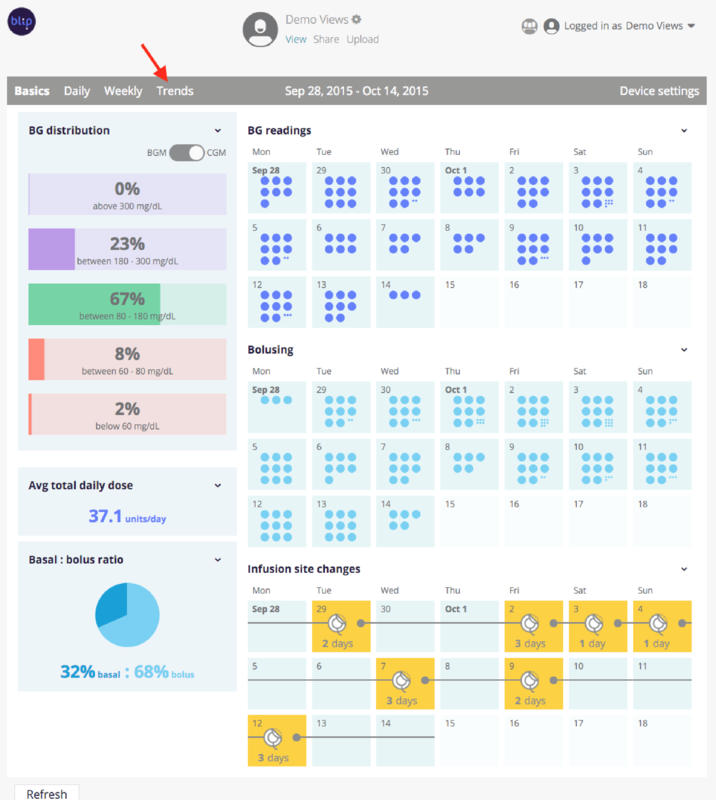 Upon logging into Tidepool, you can access the Trends view by clicking on the link to Trends in the header above the view. This view is intended to let you see the eponymous trends in your blood glucose values. The x-axis represents the range of blood glucose values. The y-axis is separated into three-hour periods of the day. A toggle on the upper left allows you to select whether the view displays 1 week, 2 weeks, or 4 weeks worth of values. A slider to the right of the week selector allows you to move to the week or weeks of your choice easily. You may wish to only show Monday, Wednesday, Friday when you have soccer practice, or to focus on showing days that have a similar schedule so you can determine where you might want to make adjustments. The Range & Average, Group, and Lines functionality can be toggled in the bottom right. Turning off range and average removes the shading bar and circle that show the range and average within each time-period. Toggling Grouping off will distribute the blood glucose values throughout the three-hour time period to correlate with when they occurred. Turning on Lines (which is off by default) will then allow you to see lines connecting values from the each respective 24-hour period. Hovering over a value will allow you to see the value's corresponding information and will highlight the line connecting to other values from that day. Clicking upon any value in the Trends view will take you to the Daily View for the date that the blood glucose value was captured. 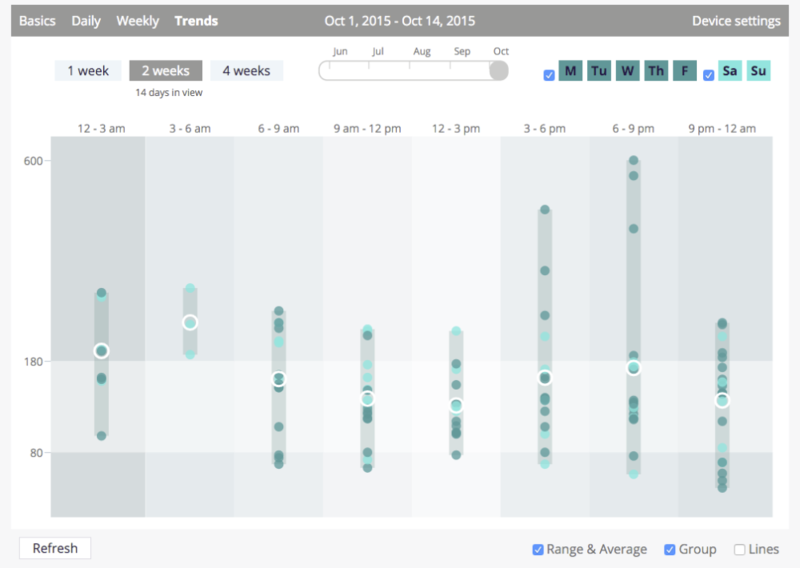 Within each 3-hour section, you will see dots representing the blood glucose values, as well as a range and average for that time period over the selected number of weeks. 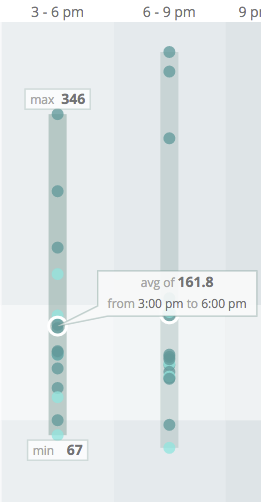 A tighter range indicates that the blood glucose values are more consistent in that time frame, and the average indicates the value around which that range is centered. Maximums and minimums help you to look for outlying values. Periods with a large range indicate more variability. Variation is often seen in the time following meals due to the challenges of correctly calculating carbohydrates and other factors. Sets of days of the week [Monday, Wednesday, Friday] or [Tuesday, Thursday] or Weekends can be isolated in order to look for patterns. For example, if you have dance class on Tuesdays and Thursdays, you can select to view just those two days so you can see which trends correlate with the extra activity. You may choose to just look at weekends to see what you can do to have tighter control on days that you are going to brunch. You can also toggle off Range & Average and Grouping, and toggle on Lines if you prefer to see connected dot representations of daily patterns. 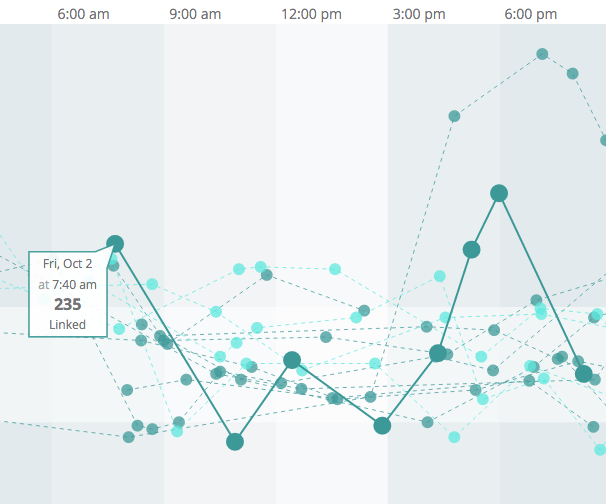 Overall, Trends view is designed to help you identify patterns in blood glucose control over the course of a day. The view can be customized to investigate activity, school, or any other weekly recurring events.